SPRINGFIELD, Mo. 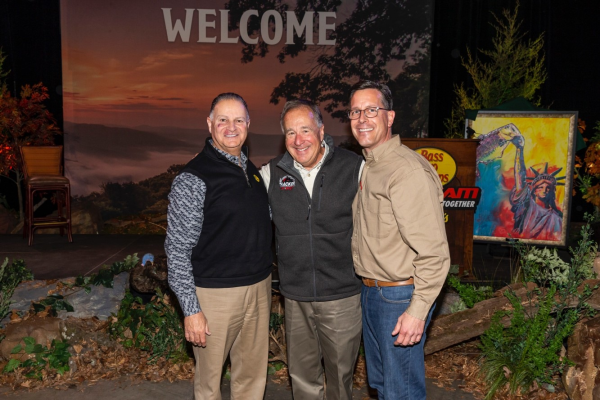 – Bass Pro Shops founder/CEO Johnny Morris has announced that Michael P. McDermott will be appointed as President Omni-Channel Retail for Bass Pro Shops - Cabela’s. McDermott will replace longtime President Jim Hagale and will begin immediately. “I want to begin this announcement by proudly and gratefully saluting our outgoing President, Jim Hagale. Jim steadfastly served our company, our people and our customers for almost 17 years and made an immeasurable positive impact,” stated Johnny Morris. His wisdom, devotion to customers and love of the outdoors made him an ideal leader for Bass Pro. Just one of countless examples, Hagale played the pivotal role working with the city of Memphis to transform the Pyramid sports arena into Bass Pro Shops at the Pyramid, one of the largest and most immersive retail stores in the world. Jim also served the vital role as Chief Integration Officer, helping to unite the two iconic outdoor brands Bass Pro Shops and Cabela’s. McDermott’s appointment marks the beginning of an exciting new era for the company. As everyone knows, the retail sector is undergoing unprecedented and meteoric change. Since founding Bass Pro Shops in an eight-square foot space in the back of his father’s Brown Derby liquor store in Springfield, MO, Johnny Morris has been a true American pioneer in outdoor retail. This same forward-looking pioneering spirit helped to establish the priority skill sets in the search for a new president. The next leader would need deep retail experience with a major company. He or she had to have a strong financial background, a proven record of growing sales and meeting budgets, a love of the outdoors, embrace the founder’s commitment to conservation, and have personal ethics and values consistent with the company’s mission. Most of all, our new president needed a passion for serving customers. Mike McDermott checked every box. For the last five years, McDermott held multiple high level positions at Lowe’s, one of the world’s leading retailers, a $70 billion Fortune 47 company with 310,000 employees. Lowe’s serves more than 25 million home improvement customers a week in the United States, Canada and Mexico. Mike began his successful Lowe’s career as SVP General Merchandise Manager, where he managed $25 billion in combined businesses and supported the company’s transition from a more limited home improvement retailer to a universal home improvement company. In 2014, he became Chief Merchandising Officer, where he directed global development and execution of all aspects of merchandise assortment, service selection, pricing, promotion, credit and sourcing activities. He established strategies to meet customer needs and maximize sales and profitability. He also owned vendor relationships and managed the overall value proposition. Most recently, Mike served as Executive Vice President and Chief Customer Officer, where he co-owned the P&L of the U.S. business and supported a multi-billion-dollar investment strategy and marketing budget. He was a key member of the executive leadership team responsible for articulating and executing a compelling omni-channel customer experience. He managed an $850 million marketing budget with expertise in campaign development, agency management, loyalty creation and traffic generation. Mike also directed the full merchandising offer for all Lowe’s stores in the U.S., Lowes.com, and all global sourcing activities designed to increase traffic, revenue and profitability. By using in-depth customer insights to inform sales and marketing decisions, develop forecasting, create pricing strategies and guide merchandise presentation, Lowe’s sales and operating income rose dramatically. In addition, Mike was accountable for a $10 billion credit card portfolio, providing a differentiated value proposition and financing flexibility for customers, delivering substantial earning leverage for the company. “The success of Bass Pro Shops and Cabela’s is based on exceptional customer service, great products and highly creative marketing. That’s Mike’s wheelhouse. Mike is a humble man of great character who will be true to our core values while leading us to new heights in full-spectrum Omni Channel to maintain our position of leadership. Mike has earned a reputation of being a good listener and we are truly honored to have such an experienced, yet down-to-earth, customer focused leader join our company,” Morris stated. In his role as Executive VP and Chief Customer officer for Lowe’s since 2013, he led an executive team of 1,500 whose purpose was to create outstanding customer experiences and differentiate Lowe’s in a competitive environment. The team’s responsibilities included merchandising, sourcing, marketing, digital, customer service and business strategy. Lowe’s stock price went up 125% in his five-year tenure. McDermott was particularly successful at establishing exclusive relationships with some of the world’s most admired brands, including Sherwin Williams, John Deere, 3M and Samsung. He uses in depth customer insights to inform sales and marketing decisions, develop forecasting, create pricing strategies and advice on merchandise presentation. He created an innovative portfolio of product and service strategies that are consistent with enterprise objectives and that maximize customer acquisition, retention and profitability. He is skilled at collaborating across functions, scaling companies for growth; managing and maximizing value throughout business and product life cycles; improving productivity through reorganizations and by applying lean processes and building and mentoring diverse, high performance teams. Mike led Lowe’s digital and omni-channel expansion when he gained responsibility for Lowes.com. His team developed and executed enabled core processes to engage customers throughout their omni-channel home improvement journey by investing in and deploying new marketing, assortment, content, data management, search, site speed and engagement tools which substantially improved traffic, conversion and overall satisfaction. McDermott joined Lowe’s from General Electric where he spent 20 years in positions of increasing responsibility spanning sales, marketing, product management, general management and senior leadership of the major appliance business. Driven to give back to his community, Mike has been active with the Boys & Girls Club of America and other local nonprofit initiatives. He and his wife Kate, along with their seven children, will be relocating to Springfield from Charlotte.